Below are some common questions we have received concerning Arctic sea ice. If you do not see your question answered here, please see Icelights: Your burning questions about Arctic sea ice and climate, to look for your question or submit a new one. You can find more information on sea ice research on the State of the Cryosphere: Sea Ice and All About Sea Ice Web page. For basic background information, see Quick Facts on Arctic Sea Ice. Why are the daily minimum values that you are currently quoting for past years slightly different than what you originally stated? Why do you use the 5-trailing average to announce the minimum/maximum and not the daily extent? Why is the monthly average extent not equal to the average of the daily extent values? What is the gray circle in the middle of some of the extent maps? How will we know if ice at the North Pole melts? What satellite is the sea ice data from? Sometimes readers report that our maps show ice incorrectly. Why? What is the error range for your images? Why do you use the 1981–2010 average for comparisons? 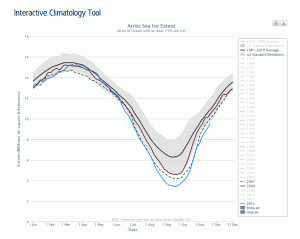 Are there other sources of sea ice data? Why does the graph now show 2006 to 2007? What is the standard deviation range on the daily image? Why don’t you publish a global sea ice extent number? What would it mean for Arctic sea ice to recover? Has the Arctic Ocean always had ice in summer? Why don’t I hear much about Antarctic sea ice? Is wintertime Antarctic sea ice increasing or decreasing? How do we know human activities cause climate change? Have undersea volcanoes caused the Arctic sea ice decline? Do icebreakers contribute to climate change? Do hurricanes in the Atlantic break up Arctic sea ice? Once Arctic sea ice is broken up, does it melt faster? If warm Arctic conditions suggest continued global warming, then why doesn’t colder-than-usual weather in my region suggest global cooling? Is renewable energy the answer? If we put white “styrofoam” in the ocean to replace sea ice, would it stop climate change? In April 2012, NSIDC updated its method of calculating daily values for the Arctic sea ice extent minimum from a 5-day centered average to a 5-day trailing average. The new calculations show, for example, that the record minimum occurred on September 18, 2007, which was two days later than we originally reported (September 16). In addition, NSIDC updates extent values, calculated initially with near-real-time data, when final processed data becomes available. These final data, processed at NASA Goddard, use higher quality input source data and include additional quality control measures. The recalculations show a 2007 record low extent of 4.17 million square kilometers (1.61 million square miles). Our originally published value was 4.13 million square kilometers. In the final data, the date of the minimum may also change for some years. We use a 5-day trailing average to smooth out the day-to-day variability from the influence of weather (such as storms causing false retrievals) and coastal or surface effects on the data. Five days is a typical synoptic timescale that helps create a continuous curve that is easier to follow and interpret. For more information on calculating daily sea ice extent values, see the Sea Ice Index documentation. As of October 2017, we have revised our averaging method for monthly extent. 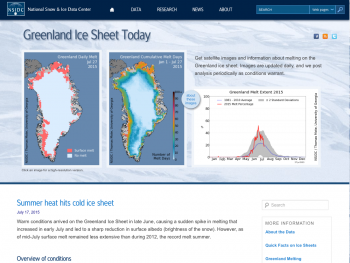 See the Product History section of the Sea Ice Index User Guide. Area and extent are different measures and give scientists slightly different information. Some organizations, including Cryosphere Today, report ice area; NSIDC primarily reports ice extent. Extent is always a larger number than area, and there are pros and cons associated with each method. A simplified way to think of extent versus area is to imagine a slice of swiss cheese. Extent would be a measure of the edges of the slice of cheese and all of the space inside it. Area would be the measure of where there is cheese only, not including the holes. That is why if you compare extent and area in the same time period, extent is always bigger. A more precise explanation of extent versus area gets more complicated. Extent defines a region as “ice-covered” or “not ice-covered.” For each satellite data cell, the cell is said to either have ice or to have no ice, based on a threshold. The most common threshold (and the one NSIDC uses) is 15 percent, meaning that if the data cell has greater than 15 percent ice concentration, the cell is considered ice covered; less than that and it is said to be ice free. Example: Let’s say you have three 25 kilometer (km) x 25 km (16 miles x 16 miles) grid cells covered by 16% ice, 2% ice, and 90% ice. Two of the three cells would be considered “ice covered,” or 100% ice. Multiply the grid cell area by 100% sea ice and you would get a total extent of 1,250 square km (482 square miles). Not all satellites pass close enough to the North Pole for their sensors to collect data there. This lack of data is indicated by a gray circle, or “pole hole,” in each image. Historically, lack of satellite data directly over the North Pole has not concerned scientists; they have always assumed that the area underneath is covered with sea ice. However, in recent years, the possibility that there will be no sea ice over the North Pole in summer has become more likely. Fortunately, some satellite sensors are able to obtain data directly over the North Pole; Data from these satellites could be used to fill in data that are missing from other satellite records. For example, the NASA Advanced Microwave Scanning Radiometer—Earth Observing System (AMSR-E) could fill in some missing data because it has a smaller pole hole than other satellites. Or, scientists could use the NASA Moderate Resolution Imaging Spectroradiometer (MODIS) instrument, which does collect data over the North Pole and thus has no pole hole. To learn more about how scientists study sea ice, see All About Sea Ice: Studying. The “Daily image update,” as well as many of the images shown in Arctic Sea Ice News & Analysis, are derived from the Sea Ice Index data product. The Sea Ice Index relies on NASA-developed methods to estimate sea ice conditions using passive-microwave data from the Defense Meteorological Satellite Program (DMSP) the Special Sensor Microwave Imager/Sounder (SSMIS). The basis for the Sea Ice Index is the data set, “Near-Real-Time DMSP SSM/I Daily Polar Gridded Sea Ice Concentrations,” and the NASA-produced “Sea Ice Concentrations from Nimbus-7 SMMR and DMSP SSM/I Passive Microwave Data.” For more details, see the Sea Ice Index. The passive-microwave data used for the Sea Ice Index is especially helpful because the sensor can “see” through clouds and deliver data even during the six months of Arctic darkness and frequently cloudy conditions. Some other satellite sensors cannot penetrate clouds to take data, so the results are sporadic and dependent upon weather conditions. Still other sensors can see through clouds, but they do not cover the entire region of the globe where sea ice exists every day, making near-real-time monitoring difficult. Furthermore, some sensors cannot provide information in winter, when polar darkness prevails. The passive microwave sea ice record dates back to 1979, one of the longest environmental data sets we know of. This provides a long-term product that consistently tracks changes in the ice cover over many years, lending additional confidence to the trends that we observe. So, although NSIDC refers to additional satellite data in developing our analysis, we primarily rely on passive-microwave data for Arctic Sea Ice News & Analysis images and content, and for tracking long-term change. Sometimes readers report that our maps show ice incorrectly, compared to on-the-ground observations or other data sources. Why is this? One reason that ice extent images may have errors is that the satellite derived images in our Daily Image Update are near-real time and have not yet undergone rigorous quality control to correct for conflicting information that is especially likely along coastlines. Areas near land may show some ice coverage where there is not any because the sensor’s resolution is not fine enough to distinguish ice from land when a pixel overlaps the coast. Sometimes, the data we receive have errors in the geolocation data, caused by problems with the instrument, which could affect where ice appears. Near-real-time data may also have areas of missing data, displayed on the daily map as gray wedges, speckles, or spider web patterns. In addition, satellite sensors occasionally have problems and outages, which can affect the near-real-time data. We correct these problems in the final sea ice products, which replace the near-real-time data in about six months to a year. Despite areas of inaccuracy, near-real-time data are still useful for assessing changes in sea ice coverage, particularly when averaged over an entire month. The monthly average image is more accurate than the daily images because weather anomalies and other errors are less likely to affect it. Because of the limitations of near-real-time data, they should be used with caution when seeking to extend a sea ice time series, and should not be used for operational purposes such as navigation. To look at monthly images that have been through quality control, click on “Archived Data and Images” on the Sea Ice Index. Another reason for apparent errors in ice extent is that the data are averaged over an area of 25 kilometers by 25 kilometers (16 by 16 miles). This means that the ice edge could be off by as much as 25 to 50 kilometers (16 to 31 miles) in passive-microwave data, compared to higher-resolution satellite systems. In addition, we define ice extent as any 25 by 25 kilometer grid cell with with an average of ?at least 15 percent ice. Ice-free areas may nevertheless exist within an area that is defined by our algorithms as ice covered. The daily image is derived from remotely sensed passive microwave data, which can be collected even during cloudy or dark conditions. Passive microwave data may show ice where none actually exists due to signal variation between land and water along coastlines, or because of atmospheric interference from rain or high winds over the ice-free ocean. Reasons that passive microwave data may not detect ice include the presence of thin, newly formed ice; the shift in albedo of actively melting ice; and atmospheric interference. Thin, newly formed ice is consistently underestimated by these data. Centers such as the U.S. National Ice Center and the Canadian Ice Service that publish sea ice data for navigation employ higher spatial resolution data that is better able to detect such thin ice. Despite the limitations in passive microwave data, they still yield good large-scale estimates for the overall extent pattern and values of the ice. Plus, the limitations are consistent, affecting the data this year in the same way they have affected it in previous years. So when comparing from year to year, these types of errors do not affect the comparison. While passive microwave data products may not show as much detail or be as accurate “on the ground” as other satellite data, they provide a consistent time series to track sea ice extent going back to 1979. Higher resolution sensors only go back to 2002. This type of long-term, consistent data is important to scientists who study whether or not change is taking place in a system. To learn more about how scientists study sea ice, see All About Sea Ice: Studying. Several possible sources of error can affect near-real-time images. Areas near land may show some ice coverage where there isn’t any because a land filter has not yet been applied and the sensor has a coarse resolution. Sometimes, the data we receive have geolocation errors, which could affect where ice appears. Near-real-time data may also have areas of missing data, displayed on the daily map as gray wedges, speckles, or spider web patterns. In addition, satellite sensors occasionally have problems and outages, which can affect the near-real-time data. We correct these problems in the final sea ice products, which replace the near-real-time data in about six months to a year. Despite its areas of inaccuracy, near-real-time data are still useful for assessing changes in sea ice coverage, particularly when averaged over an entire month. The monthly average image is more accurate than the daily images because weather anomalies and other errors are less likely to affect it. Because of the limitations of near-real-time data, they should be used with caution when seeking to extend a sea ice time series, and should not be used for operational purposes such as navigation. To look at monthly images that have been through quality control, click on “Archived Data and Images” on the Sea Ice Index. NSIDC does not have error bars on the time series plot shown in the “Daily Image Update” and the daily time series plot (usually labeled “Figure 2”) because we strive to keep the images concise and easy to read. Plus, the error bars would be quite small compared to the total extent values in the images. We estimate error based on accepted knowledge of the sensor capabilities and analysis of the amount of “noise,” or daily variations not explained by changes in weather variables. For average relative error, or error relative to other years, the error is approximately 20,000 to 30,000 square kilometers (7,700 to 11,600 square miles), a small fraction of the total existing sea ice. For average absolute error, or the amount of ice that the sensor measures compared to actual ice on the ground, the error is approximately 50 thousand to 1 million square kilometers (19,300 to 386,100 square miles), varying over the year. During summer melt and freeze-up in the fall, the extent may be underestimated by 1 million square miles; during mid and late winter before melt starts, the error will be on the low end of the estimates. It is important to note that while the magnitude of the error varies through the year, it is consistent year to year. This gives scientists high confidence in interannual trends at a given time of year. The absolute error values may seem high, but it is important to note that each year has roughly the same absolute error value, so the decline over the long term remains clear. NSIDC has high confidence in sea ice trend statistics and the comparison of sea ice extent between years. What is standard deviation and how does it relate to sea ice extent? Why do you use the 1981 to 2010 average for comparisons? NSIDC scientists use the 1981 to 2010 average because it provides a consistent baseline for year-to-year comparisons of sea ice extent. Thirty years is considered a standard baseline period for weather and climate, and the satellite record is now long enough to provide a thirty year baseline period. If we were to recalculate the baseline every year to incorporate the most recent year of data, we couldn’t meaningfully compare between recent years. To borrow a common phrase, we would be comparing apples and oranges. The problem with relying on a sliding average becomes clear over time, when we try to compare new years of data with previous years. For example, if we rely on a standard, unchanging baseline like 1981 to 2010, we can easily and clearly compare September 2007 and September 2008 with each other. However, if we were to use a sliding baseline of 1979 to 2006 for September 2007, and a sliding baseline of 1979 to 2007 for September 2008, we would no longer be comparing “apples to apples” when we compared the two years to the baseline. Arctic Sea Ice News and Analysis and the Sea Ice Index moved to a baseline period of 1981 to 2010 starting July 1, 2013. Previously, NSIDC had used 1979 to 2000 as the comparison period. For more information about this change, see our July 2, 2013 post and the Sea Ice Index. Are there other sources of sea ice data? How do these sources differ from NSIDC data? Why do different years appear on the graph? Each year at the beginning of January, the reference year on the daily extent graph changes. The graph of daily sea ice extent for the Northern Hemisphere shows ice extent in the current year, the 1981 to 2010 average, and the year with record low ice extent, (currently 2012). The graph has a five month window. This means that in December, the graph shows the record year of 2012, plus some of 2008 (2007-08) and 2013 (2012-13). When we shift the view in January to show five months beginning in October, the graph shows the end of 2006 and the beginning of 2007 (2006-07) and the end of 2011 and the beginning of 2012 (2011-12). In February 2010, we added the range of standard deviation to our daily extent chart. The gray area around the 1981 to 2010 average line shows the two standard deviation range of the data, which serves as an estimate of the expected range of natural variability. For the past few years, Arctic sea ice extent for most months has been more than two standard deviations below the 1981 to 2010 mean, particularly in summer. Standard deviation is a measure of variation around a mean. One standard deviation is defined as encompassing 68% of the variation, and two standard deviations encompass 95% of the variation. Scientists use standard deviations as a way to estimate the range of variability of data. In the context of climate data like sea ice extent, it provides a sense of the range of expected conditions. Measurements that fall far outside of the two standard deviation range or consistently fall outside that range suggest that something unusual is occurring that can’t be explained by normal processes. For sea ice extent data, the standard deviation is computed for each day of the year from the extent on that day over the 30 years of the baseline period, 1981 to 2010. Doubling the standard deviation to produce a 95% range means that 95% of the daily extents for the years 1981 to 2010 fall within that range. In recent years, ice extent has declined and in the summer especially, it has regularly fallen outside of two standard deviations. This suggests that the recent decline in sea ice extent represents a significant change in conditions from 1981 to 2010 time period. The combined number, while easy to derive from our online posted data, is not useful as an analysis tool or indicator of climate trends. Looking at each region’s ice extent trends and its processes separately provides more insight into how and why ice extent is changing. Sea ice in the Arctic is governed by somewhat different processes than the sea ice around Antarctica, and the very different geography of the two poles plays a large role. Sea ice in the Arctic exists in a small ocean surrounded by land masses, with greater input of dust, aerosols, and soot than in the Southern Hemisphere. Sea ice in the Southern Hemisphere fringes an ice-covered continent, Antarctica, surrounded by open oceans. While both regions are affected by air, wind, and ocean, the systems and their patterns are inherently very different. Moreover, at any point in time, the two poles are in opposite seasons, and so a combined number would conflate summer and winter trends, or spring and autumn trends, for the two regions. Sea ice extent normally varies from year to year, much like the weather changes from day to day. But just as one warm day in October does not negate a cooling trend toward winter, a slight annual gain in sea ice extent over a record low does not negate the long-term decline. Even though the extent of Arctic sea ice has not returned to the record low of 2012, the data show that it is not recovering. To recover would mean returning to within its previous, long-term range. Arctic sea ice extent remains very low. In addition, sea ice remains much thinner than in the past, and so is more vulnerable to further decline. While ice thickness is difficult to measure using satellites, a variety of data sources and estimates indicate that the Arctic ice cover remains thin. For more information on ice thickness, see the Icelights article, Getting beneath the ice. So what would scientists call a recovery in sea ice? First, a true recovery would continue over a period of multiple years. Second, scientists would expect to see a series of minimum sea ice extents that not only exceed the previous year, but also return to within the range of natural variation. In a recovery, scientists would also expect to see a return to an Arctic sea ice cover dominated by thicker, multiyear ice. The satellite record only dates back to 1979. However, scientists have used historical records of sea ice conditions to estimate sea ice extent before 1979. For more on this topic, read the Icelights post, Arctic sea ice before satellites. We know for sure that at least in the distant past, the Arctic was ice-free. Fossils from the age of the dinosaurs, 65 million years ago, indicate a temperate climate with ferns and other lush vegetation. Based on the paleoclimate record from ice and ocean cores, the last warm period in the Arctic peaked about 8,000 years ago, during the so-called Holocene Thermal Maximum. Some studies suggest that as recent as 5,500 years ago, the Arctic had less summertime sea ice than today. However, it is not clear that the Arctic was completely free of summertime sea ice during this time. sheets had partly melted. Because of the burning of fossil fuels, global averaged temperatures today are getting close to the maximum warmth seen during the Eemian. Carbon dioxide levels now are far above the highest levels during the Eemian, indicating there is still warming to come. According to analyses at NASA and NOAA, the past decade has been the warmest in the observational record dating back to the 19th century and the Arctic has been substantially higher than the global average. How do we know human activities cause global climate change? Sometimes in everyday use, people associate “the North Pole” with the entire Arctic region. However, when scientists discuss the North Pole, they mean the geographic North Pole, a single point on the globe located at 90 degrees North. The term “Arctic” generally refers to a much larger region that encompasses the northern latitudes of the globe. The Arctic includes regions of Russia, North America, and Greenland, as well as the Arctic Ocean. The scientific community has a range of predictions concerning when we could see an ice-free Arctic Ocean in summer. Predictions range from sometime in the next ten years, to 2100. For more information on predictions of an ice-free Arctic, see the Icelights post, When will the Arctic lose its sea ice? NSIDC scientists do monitor sea ice in the Antarctic, and sea ice in the Antarctic is of interest to scientists worldwide. While there are many peer-reviewed journal articles on the topic of Antarctic sea ice and its changes, it has received less attention than the Arctic. Antarctic sea ice has in general changed far less dramatically than Arctic ice. Moreover, changes in Antarctic sea ice are unlikely to have a significant direct impact on the temperate southern latitudes. For more information on Antarctic sea ice, see the Icelights post, Sea ice down under: Antarctic sea ice and climate. Antarctic sea ice data is available on the NSIDC Sea Ice Index. Wintertime Antarctic sea ice is increasing at a small rate and with substantial year-to-year variation. Monthly sea ice data show trends of increasing sea ice extent that are slightly above the mean year-to-year variability over the satellite record (1979 to present). In more technical terms, the trends are statistically significant at the 95% level, although small (~1% per decade as of 2016). Global climate model projections for sea ice trends around Antarctica are at odds with what is being observed. Nearly all models to date project a slight decline in sea ice extent at present and for the next several decades. The mismatch between model results and observations is a topic of research, and a basis for investigations to find the processes that must be added to the models to align them with what is observed. However, analysis of the variability of Antarctic sea ice in models shows that it is possible that the current trend of increasing sea ice extent is a result of the high variability in the Antarctic sea ice and climate system. The dominant, though subtle, change in the climate pattern of Antarctica has been a gradual increase in the westerly circumpolar winds. Models suggest that both the loss of ozone (the ozone hole that occurs in September/October every year) and increases in greenhouse gases lead to an increase in frequency of this climate pattern. When winds push on sea ice, they tend to move it in the direction they are blowing, but the Coriolis effect adds an apparent push to the left. In the unconfined system of Antarctic sea ice, this pushes the ice northward away from the continent. By spreading sea ice westward and a little northward (and since we measure extent with a 15% cutoff) the gradual trend towards faster mean winds means a gradual trend toward spreading of the ice cover. This general pattern may be part of the explanation for the trend. Recent records of wintertime extents (in 2012, 2013, and 2014) appear to be associated with patterns in air circulation related to the westerly wind regime. The Amundsen Sea Low (ASL), a climate feature of the annual average pressure pattern for Antarctica, varies in both strength and location on a seasonal basis. The ASL tends to be stronger when westerly winds are strong. The ASL, and its effect of sea ice formation and drift, appears to be a major part of the recent string of record winter maximums. More recently (since July 2015) sea ice has returned to near-average conditions, and as of this writing is at a record daily low extent. This highlights the inherent variability in the system. However, one analysis that has attempted to explain both the very large winter extents of 2012, 2013, and 2014, and the subsequent lower and near-average winter maximums in 2015 and 2016 has suggested that the El Niño Southern Oscillation and a Pacific trend called the Pacific Decadal Oscillation (a residual tendency toward El Niño or La Niña in the Pacific that shifts on multi-decadal timescales) may be linked to the change. In other words, the advent of a strong El Niño in late 2015 and early 2016 may have shifted wind and ocean circulation to favor lower extents after a series of La-Niña-prone years (Meehl, 2016). The trend towards stronger circumpolar winds has also caused a sea ice extent decline near the Antarctic Peninsula. In general, the winds tend to dive slightly southward as they approach the Peninsula, an effect of the mountain ridges of the Andes and other circulation features in the Amundsen and Bellingshausen Sea (the ASL mentioned above). A stronger wind from the northwest brings warmer conditions and therefore less ice to the region. Lastly, the El Niño and La Niña cycle also appear to influence sea ice in the Pacific sector. El Niño patterns (a warm eastern tropical Pacific) are associated with warmer winds and less ice; the opposite is true for La Niña. Climate models suggest that the observed increases in Antarctic sea ice are not outside natural variability. However, all models indicate that the ice extent should decrease as greenhouse gases in the atmosphere increase further later in this century. For more information, see All About Sea Ice: Arctic vs. Antarctic and the State of the Cryosphere: Sea Ice. To see data on Antarctic sea ice, see the Sea Ice Index. Fossil fuel burning is responsible for climate change because of the way in which an increased concentration of carbon dioxide in the atmosphere alters the planet’s energy budget and makes the surface warmer. The most fundamental measure of Earth’s climate state is the globally averaged surface air temperature. We define climate change as an extended trend in this temperature. Such a change cannot happen unless something forces the change. Various natural climate forcings exist. For example, periodic changes in the Earth’s orbit about the sun alter the seasonal and latitudinal distribution of solar radiation at the planet’s surface; such variations can be linked to Earth’s ice ages over the past two million years. Changes in solar output influence how much of the sun’s energy the Earth’s surface receives as a whole; more or less solar energy means warmer or cooler global climate. Explosive volcanic eruptions inject sulfur dioxide and dust high into the stratosphere, blocking some of the sun’s energy from reaching the surface and causing it to cool. These are climate forcings because they alter the planet’s radiation or energy budget. An increase in the atmosphere’s concentration of carbon dioxide is also a climate forcing: it leads to a situation in which the planet absorbs more solar radiation than it emits to space as longwave radiation. This means the system gains energy. The globally averaged temperature will increase as a result. This is in accord with a fundamental principle of physics: conservation of energy. As humans burn fossil fuels, adding carbon dioxide to the atmosphere, globally average temperature rises as a result. Some people wonder if the reason the sea ice is declining and the planet is warming can be explained by sunspots, which are related to variations in the Sun’s energy output over time. While changes in the suns output can affect the Earth’s climate, the recent warming cannot be explained by changes in solar activity. A recent study discovered active volcanoes on the floor of the Arctic Ocean, and some people have wondered if they are causing sea ice to melt. While volcanic eruptions surely warmed the ocean in the immediate vicinity of the eruptions, the amount of heat they produced compared to the large volume of the Arctic Ocean is small. The Arctic Ocean covers 14 million square kilometers (5.4 million square miles), about 1 ½ times the size of the United States or 58 times the size of the United Kingdom. In its deepest spots, the Arctic Ocean is 4,000 to 5,500 meters (13,000 to 18,000 feet) deep. The heat from the volcanoes would have dispersed over an enormous volume and had little effect on ocean temperature, much as a bucket of boiling water emptied into a lake would have little effect on the lake’s temperature. Second, the eruptions would have introduced heat deep below the sea ice that floats on the ocean surface. The tops of even the tallest undersea volcanoes are more than 1,000 meters (3,000 feet) deep. The Arctic Ocean is strongly stratified, which prevents layer mixing and makes it difficult for any deep water, even deep water warmed by heat from volcanoes, to reach the surface and melt the ice. This layering results from a strong density gradient: water layers near the surface are less salty and therefore less dense, while bottom waters are the densest. Unlike most oceans, where density gradients are determined by both salinity and temperature, Arctic Ocean waters are heavily stratified primarily because of variations in salinity. When icebreakers travel through sea ice, they leave trails of open water in their wake. Dark open water does not reflect nearly as much sunlight as ice does, so sometimes people wonder if icebreakers speed up or exacerbate sea ice decline. In summer, the passages created by icebreakers do increase local summertime melting because the ships cut through the ice and expose new areas of water to warm air. However, the melt caused by an icebreaker is small and localized. Channels created by icebreakers are quite narrow and few in number compared to natural gaps in the ice. In winter, any openings caused by icebreakers will quickly freeze over again. So, scientists do not think that icebreakers play a significant role in accelerating the decline in Arctic sea ice. NSIDC is not aware of any evidence that hurricanes in the Atlantic, or elsewhere on the planet, play a role in Arctic sea ice decline. Yes—waves, sea spray, winds, and melt ponds all affect sea ice. If the ice is broken up, the areas of open water between floes absorb a great deal of solar energy in summer. That energy can be transferred both to the sides of the floes and underneath the floes, promoting further melt. Wind direction is also important. Warm southerly winds can promote melt both because they bring warm air. Also, southerly winds move ice northward away from the coast. Storms and their associated sea spray can work to reduce the albedo, or reflectivity, of the ice, further increasing melt. Other effects of wind on sea ice either push the ice together, resulting in a smaller extent, or spread it out, resulting in larger expanses of sea ice at a lower density. These processes are known as convergence and divergence, respectively. Another interesting question is, are these processes captured in global climate models? Computer simulations do not capture the level of detail that these sorts of processes entail. For example, while all of the global climate models participating in the most recent Intergovernmental Panel on Climate Change report show a decline in Arctic sea ice over the period of available observations, none of them match the severity of the trends we actually observe. It may be that some of the more detailed melt processes are not being captured properly. We note recent Arctic weather conditions in our reports because they help us understand if weather has affected the ice this season. The year’s weather conditions in the Arctic do not create or indicate climate warming, just as a cooler season in any region of the Earth does not mean that climate is cooling. One season’s weather could either speed up or slightly slow down the loss of Arctic sea ice this year, but it will not change the climate trend and the basic causes of warming. Climate is a measure of the average conditions over a long period of time, so it is a better way to tell if changes may be persistent. Climate records show that the Arctic has warmed substantially over the past decades. The Arctic continues to warm faster than any other region of the world. Global data still show the Earth to be warming on average. Scientists expected that the Arctic could warm faster than other places on Earth, because of the way the Arctic interacts with the global climate system. Arctic warming is a special concern, because its effects can speed up the warming of the whole Earth. Resurfacing the Arctic Ocean with ice substitutes probably would not work to stop climate change. One reason is that the Arctic is a vast region. If we attempted to bring the Arctic back to long-term average levels of “ice,” we would need to add approximately 2.6 million square kilometers (1 million square miles) of foam to the Arctic Ocean. This would be the equivalent of covering Alaska and Texas, or ten United Kingdoms, with polystyrene foam. Studies would also need to be done concerning the environmental impact of introducing such vast quantities of a human-made substance in the ocean, the albedo difference between ice and foam, the longevity of the solution, the cost of such an effort, and the carbon dioxide emitted during foam production and placement. That said, even if foam were a viable solution that was immediately undertaken, it still would not halt climate change right away. The climate system already has some heating yet to be realized; it has not yet caught up with the effects of fossil fuel burning of past decades. People sometimes refer to this future heating as heat “in the pipeline.” In a way, this is similar to how a credit card works. We have already “spent” fossil fuels, but we have not yet “paid” the full charge in terms of temperature rise. So, even if we were to prevent any more ice from melting, the planet still has some additional warming on the horizon. I have a question that isn’t answered here. Who may I contact? Members of the general public can contact NSIDC User Services with questions or concerns. Members of the press: +1 303 492.1497.